The Division of Pediatric Critical Care Medicine coordinates the critical care services of Norton Children's Hospital, the regional referral center for critically ill and injured infants, children and adolescents. The multi-disciplinary "Just for Kids" Critical Care Center treats children with severe medical illnesses and supports a variety of programs, such as the Pediatric Trauma, Cardiovascular Surgery and Organ Transplantation. A variety of medical and surgical conditions that require intensive monitoring are cared for daily in a family oriented atmosphere. Diagnoses frequently encountered include shock, trauma, traumatic brain injuries, ingestions/poisonings, status epilepticus, status asthmaticus, diabetic ketoacidosis, pediatric respiratory failure, congenital heart disease, metabolic abnormalities and cardiac dysrhythmias. Patients with complex surgical needs, including cardiovascular and neurosurgical operations, are also cared for in the Critical Care Center. One member of the division serves as Director of Transport. We serve as medical control providing air (fixed wing and helicopter) and ground transportation of infants and children by a critical care neonatal/pediatric team through our Just for Kids Transport Service. The Norton Children’s Hospital Pediatric Intensive Care Unit currently has 26 beds. We make every effort to provide family centered care including a sleeping room for parents, dedicated critical care waiting room, and a meditation room. We strive to include our parents in our rounding process and make family satisfaction a priority. The Division of Critical Care Medicine provides procedural sedation services through the University Children's Sedation Service. Services are provided to both inpatients and Hematology-Oncology patients at Norton Children's Hospital. The service safely sedates around 1,100 patients annually. One member of the Division directs the palliative care medicine services at Norton Children's Hospital through the Hearts and Hands Palliative Care Program. Research interests of the division include patient safety, procedural sedation and analgesia, pharmacokinetics, education, patient simulation and pediatric acupuncture. Members of the Division of Critical Care Medicine participate in research through the Kosair Charities Pediatrics Clinical Research Unit. A robust Simulation Program enhances the academic experience for the entire health care team. 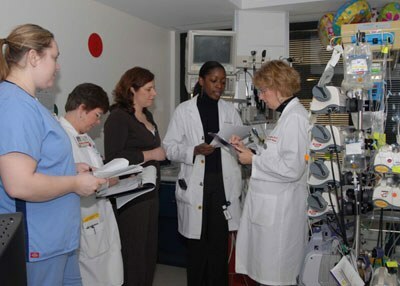 By providing a high-fidelity, true-to-life experience using mannequins with real-time computerized and personal feedback, our clinicians, nurses, and therapists can refine their skills, develop improved team dynamics, and proactively work to continue to provide world-class care. The division has an accredited Pediatric Critical Care Medicine fellowship training program.